It's that time of the week again, make way for the nails of week. This time another nail paint from our home brand LAKME, it's true wear # 244. Price: INR 90 for 9 ml of the product, standard packaging with a glass bottle and plastic cap housing the brush. My experience has been decent with these LAKME nail paints, don't chip much and stay shiny for atleast 2-3 days. What I love about this one is the colour, comes as true blue purple with some fine silver and golden shimmers, looks very classy and dressy at the same time. 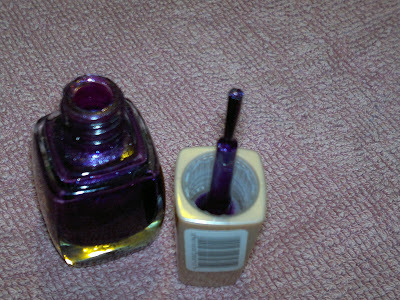 Though takes some time to dry between coats (around 5 -1 10 minutes), the nail paint doesnot make my nails yellow. Product rating: A-, available at all LAKME beauty counters and also online via e-shopping websites. Would recommend this to everyone looking for a good paty wear shade and for those who love purple like me.